WARNING: Sizzix die overload....hahahaha Don't I just love me some Sizzix dies!!! This centerpiece was created with lots of Sizzix dies with the main focal point being the lovely Brenda Walton Christmas Sleigh Favor Box and the Reindeer. Oh how I just love those two dies together! 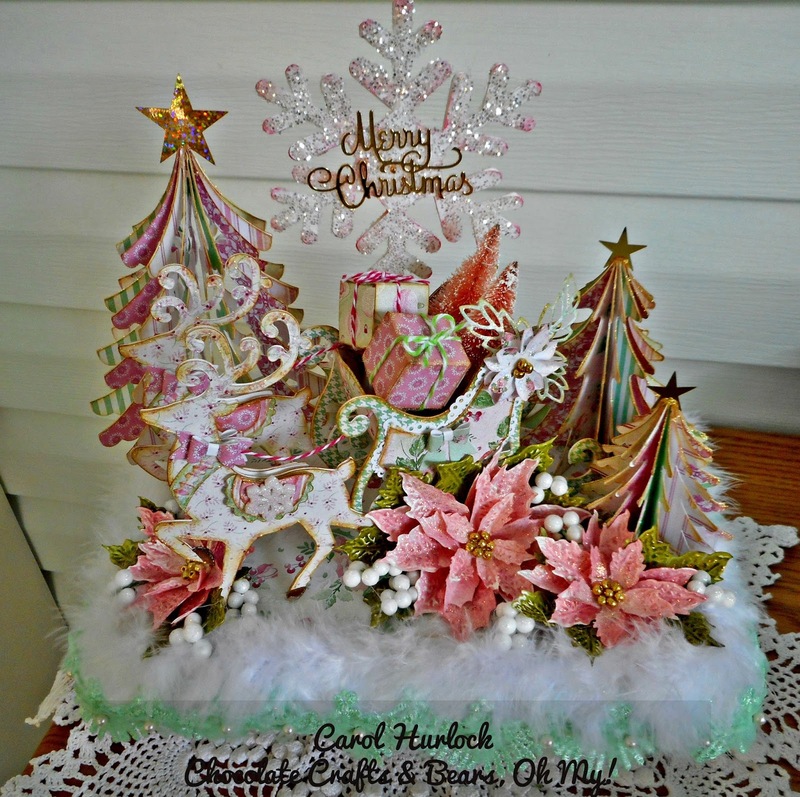 The centerpiece was created on a square silver tray that has been painted white and mounted on a candlestick.....both from the Dollar Store. The big gold bow is also a Brenda Walton die. The Snowflake in the background is from Sizzix and the "Merry Christmas" is from Cottagecutz. Aren't these just awesome. 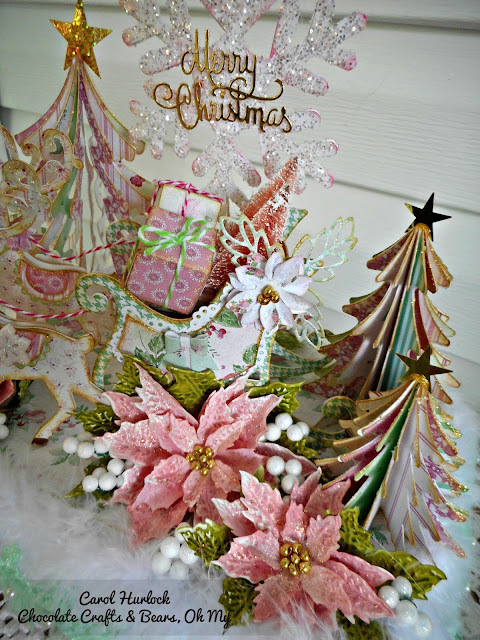 The Poinsettia are Tim Holtz Poinsettia die and embossing folder. I used Barn Door and Fired Brick distress stain and inks to color these flowers and Peeled Paint for the leaves. Little gold beads from Michael's were used for the centers of the flowers. Oh, and here's another one I created in another color. The designer paper was from the same Pink Paisley Christmas pad as the traditional color I did above. I just loved this paper pad and had to do this color variation. 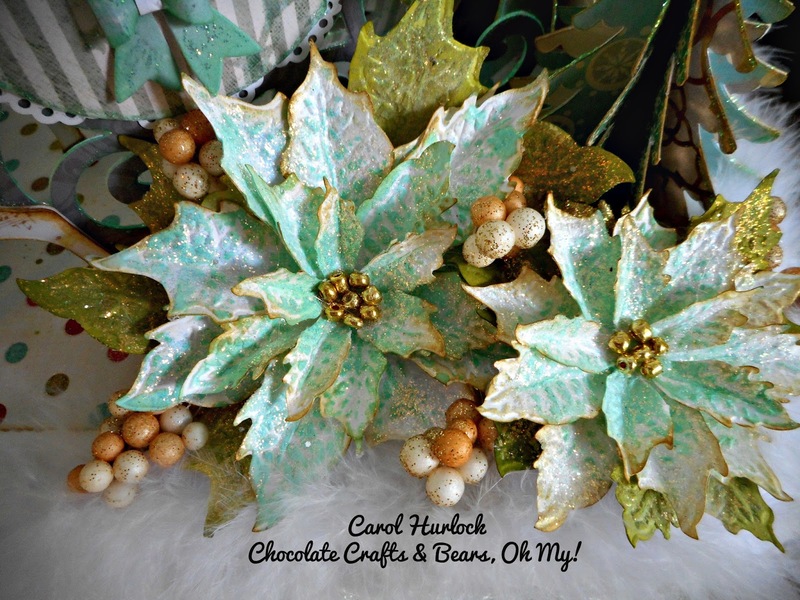 Here are those luscious Tim Holtz Poinsettia again but in Cracked Pistachio tipped with Brushed Corduroy. All those little white berries you see come from the Dollar Store. The sleigh is filled with presents and bottle brush Christmas trees. Those presents are 1" cubes I created myself with my Martha Stewart score board-tied with bakers twine, of course! 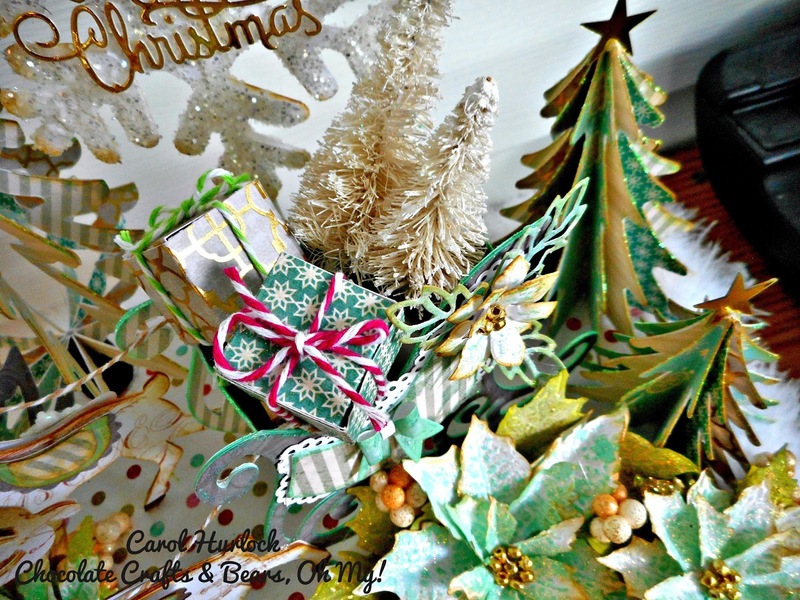 The 3D trees are Sizzix Brenda Walton Christmas Tree Die. 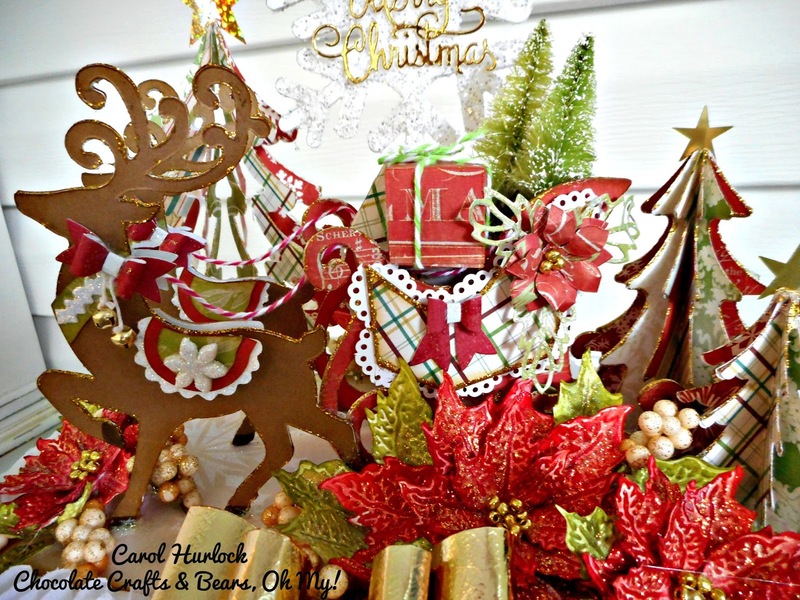 Besides Tim Holtz, Brenda Walton is another favorite of mine. 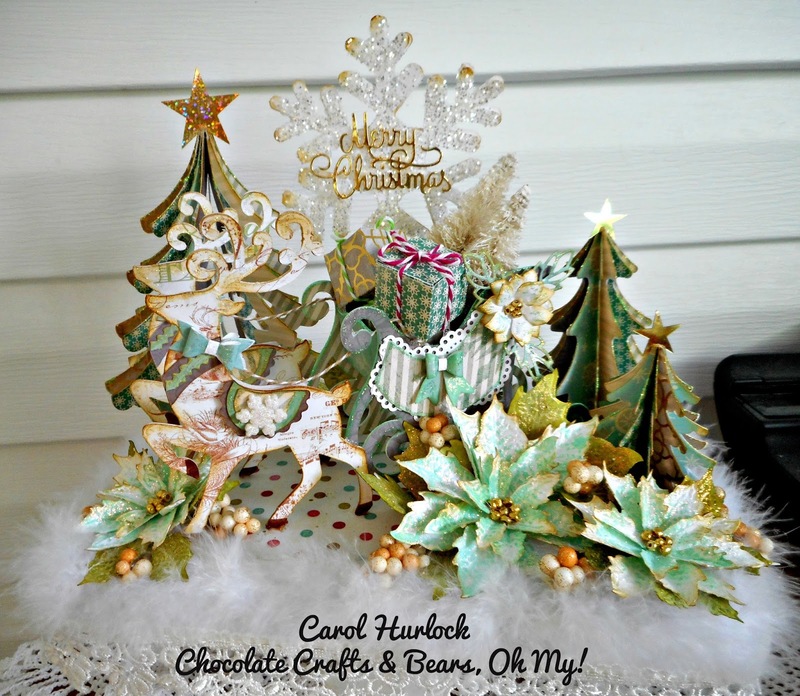 Her dies are so sweet and very easy to put together! Look here!!! Another color variation. Of course, I just had to do a pink one. Here you can see the lovely trees and Poinsettia again. For these Poinsettia I used Spun Sugar and Victorian Velvet. The paper collection is digital from Nitwit Collections called Holiday Bouquet. I just love that paper collection so much. You will be seeing more holiday projects from me using that paper. Lots of detail on these beautiful reindeer. From the little bows to the snowflake buttons it's a feast for the eyes and did I mention it was a blast to create!!! I love the marabou trim around the base. 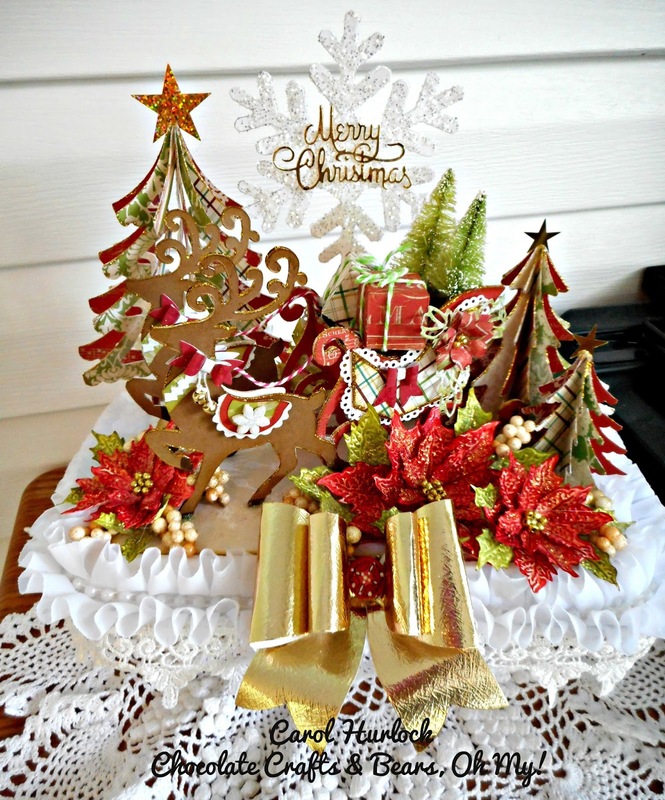 It gives the whole design a soft festive ambiance. So which color variation is your favorite? I'd love to hear what you think. It's hard to choose isn't it!!! lol Also, do you like making your own flowers? I know that is one of my favorite things to do. But, it does slow me up a lot while making my projects. 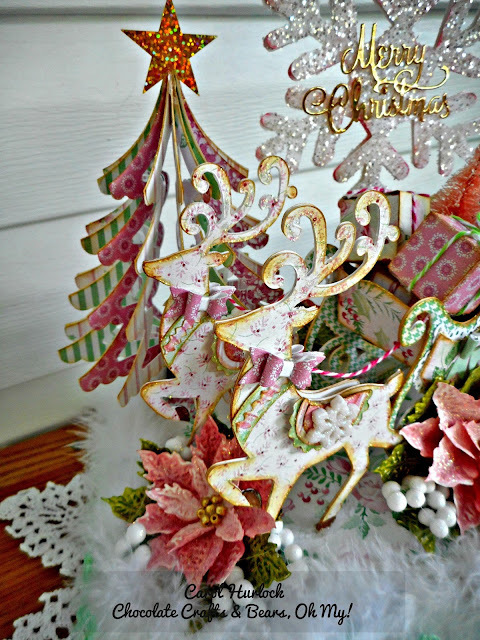 This Tim Holtz Poinsettia is one of my favorite. My flowers are a big process especially these. You have to die cut, emboss, stain, distress, paint with glue and sprinkle glitter, let dry, and then shape. It take a while. But to me it is personally rewarding. Everything else went together fast. I have included this video of my 3 projects in case you would like to see in more detail. Thanks so much for visiting today. Now get out those dies and create!!!! WOW, Carol!! They are amazing!! I think the light green one is my favorite! I still and adore the butterfly ones that you made for me! I have to ask.....are you Mrs. Claus?!?! Oh my word! These are beyond beautiful. I think they are fantastic! Love the traditional colors and I ADORE your 2nd one and your pink one.....and well all of them. YOWZA! These really are AHMAZING!!! Thanks so much for playing along with us at The Mod Squad Challenge Donna, Challenge Host. Wow! These are gorgeous and the poinsettias are to die for!! Spectacular! Thanks for linking with us a Decorate to Celebrate. Beautiful project!